Asisat Oshoala scored four times as Nigeria reached the final with a thumping 6-2 victory over Korea DPR in the highest-scoring semi-final ever seen at the FIFA U-20 Women's World Cup. Oshoala also laid on two more goals in a win that leaves the Super Falconets to face either France or Germany on Sunday at Montreal's Olympic Stadium, and the North Koreans to play for third place at the same venue. Nigeria have had a tendency to score quick goals during their time at the FIFA U-20 Women’s World Cup Canada 2014, and Courtney Dike continued that trend with a goal barely more than a minute after kick-off. Oshoala set the tone by setting it up, releasing Dike in behind Korea DPR’s captain Choe Sol-Gyong before the No8 expertly picked her spot just inside the far post. At the half-way point of the first period, Oshoala doubled Nigeria’s lead, capitalising on a poor touch from centre-half Song Kyong-Hui before rounding the keeper and passing into an open goal. Less than ten minutes later, Ri Un-Sim – arguably the North Koreans’ most dangerous attacker throughout the tournament – pulled one back with a great bit of individual skill after receiving a long ball from midfield. Ri beat two defenders on the cutback and finished past Sandra Chiichii with a powerful shot into the top corner. From there, Korea DPR looked inspired in search of an equaliser but the score remained 2-1 at half-time before Nigeria swiftly put the game out of reach within minutes of the restart. In similar fashion to her appearance and goal in the quarter-finals against New Zealand, Uchechi Sunday came on as a substitute and within a minute scored to restore her team's two-goal lead. Oshoala then put the game out of reach on the hour mark when she hit a stunning shot from 20 yards out that left Kim with no chance as it flew into the top corner. Korea DPR had one last glimmer of hope two minutes later when Ugo Njoku handled the ball in her own area, allowing Jon So-Yon to score from the penalty spot. However, Oshoala’s quality shone through yet again in the 68th minute when she completed her hat-trick, beating Song and winning a foot race with Kim to once more fire into an empty net. Nigeria were not finished there, though, and with five minutes from time the No4 matched the number on her jersey. The goal came as a result of another North Korean defensive miscue less than six yards from goal, resulting in a simple tap-in. 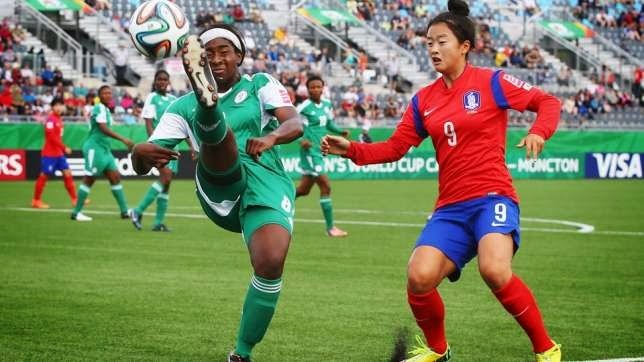 Oshoala had taken the wind out of the Korean sails far earlier in the match and when the final whistle sounded, her Nigerian team-mates surrounded her in celebration, while Hwang Yong-Bong's side trudged off disconsolately.